Our brand new pocketfold wedding invitations have arrived! 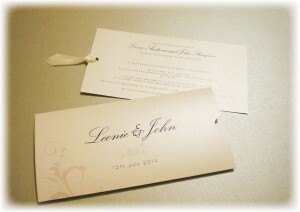 With so many brides asking for pocketfold wedding invitations we have introduced these to satisfy your needs! Our pocketfolds are 21x10cm with a half moon cut out of the end where the ribbon knot sits to tie your invitation and optional extras all together. As with all AdelaRosa invitations, these come with envelopes as standard. 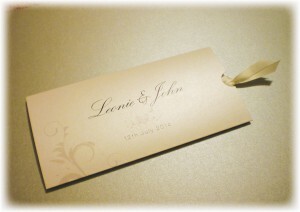 We will supply the ribbon pre-cut and a handy set of instructions to show you how to tie the ribbon on each invitation. So all you need to do is tie them up, slip them in the pocket and send them out to your guests! We can do any of our existing designs from the Classic Collection or Vintage Collection as a pocketfold invitation, or we can create one in a brand new style just for you. Watch this space for a gallery of images, in the meantime we just show here the format of the pocketfolds so you can get an idea. We have a number of existing designs that you can have tweaked to your tastes, or you can go for a completely original idea. We are happy to help come up with a design based on your ideas so you get top quality bespoke wedding invitations from your own ideas. Just let us know the picture you have in your head of your wedding invitations and we will work with you to create it! Take a look at the ready made invitations on this site and bear in mind we can make any design into the pocketfold format wedding invitations. It is your big day so you should get the invitations you really want. Please contact us to discuss your invitation ideas further.